Oct 1, 1964 "The Trumbull Street Fire"
All were killed when the front wall of a vacant 4-story toy factory, located at 34 Trumbull Street, collapsed and a second smaller collapse injured several other members. A civilian, Andrew Sheehan, 25 a "spark" was also injured and died later that morning in the hospital. 12 members were injured but some remained on duty until all the trapped members had been removed. This was the Trumbull Street fire, 5 alarms Box 1671, (Shawmut Avenue & Brookline Street.) Lieutenant McCorkle had 27 years, Lieutenant. Geswell had 9 years, Firefighter Murphy had 7, Firefighter Sheedy had 6 and Firefighter Clougherty had 4 years of service. Firefighter Robert Clougherty was the son of Assistant Chief of Department John E. Clougherty. The alarms were sounded at 0032 hours, the Working Fire at 0036 hours, the 2nd alarm at 0037 hours, the 3rd alarm at 0042 hours, the 4th alarm at 0045 hours and the 5th alarm at 0052 hours. On Oct. 1, 1964, an abandoned four-story factory caught fire in the South End of Boston. 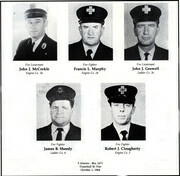 The building collapsed, resulting in the death of five Boston Fire Department firefighters: Lt. John J. McCorkle (Engine 24), Lt. John J. Geswell (Ladder 26), Firefighter Robert J. Clougherty (Engine 3), Firefighter Francis L. Murphy (Engine 24) and Firefighter James B. Sheedy (Ladder 4). A civilian photographer also died in the collapse. Twelve firefighters were injured. On the night of Oct. 1, 1964, a passerby spotted a fire on Trumbull Street and pulled Box 1671, transmitting the alarm at 0032 HRS. Apparently, the fire had been burning for a while, as investigators later learned that the passerby had smelled smoke in the area for several hours. Engine 3 and Ladder 3 responded and, upon arrival, their commanding officers saw heavy fire showing from the building’s upper floors. Engine 3 ran a line into the building and attempted to make it to the second floor, but they were forced back to the landing on the first floor due to the heavy fire conditions. Ladder 3 started to raise ground ladders, and its aerial was thrown to the roof of a four-story building just to the left of the fire building. Ladder 13 raised some of their ladders on the other side of the fire building. They were also making forcible entry into the four-story building next door where there was a large loading dock-type door. After a quick size-up, District 4 Fire Chief John McCarthy ordered a second alarm transmitted at 0038 HRS. Due to the congested area and heavy fire conditions, Deputy Chief Fred Clauss ordered a third alarm at 0042 HRS. Clauss then decided to get all the firefighters out and gave that order to McCarthy. Clauss followed a line into the building and gave the order to “get out!” to Lt. Fraser of Engine 3, and then went about his duties to make sure all other companies were getting out. As the fire grew, Clauss ordered a fourth alarm at 0045 HRS. Engine 22 was ordered to take a line over Ladder 3’s aerial to the roof of the building on the left. Engine 7 was ordered to take a line over a small ladder that was thrown to the roof of the building to the right and operate in the rear. Engine 43 and Engine 21 would follow. They used a 20' ladder to bridge the small alley and enter the building on West Brookline Street. There was heavy fire in the rear showing from the windows on the top floors. The first collapse occurred as Engine 24 and Engine 37 prepared to advance lines over the 35' ladders thrown in front of the building. Fire personnel were knocked from ladders and balcony fire escapes; other men on the ground were buried and burned. The firefighters from Ladder 3 in the rear of the building heard the loud crash and ran to help. As they tried to help, another collapse occurred. Clauss was one of the men injured in the second collapse. A fifth alarm was transmitted at 0054 HRS. Fire personnel continued to work the fire while trying to rescue their fellow firefighters. An investigation into the cause of the fire, conducted by the Arson Squad and Boston Police, found that two boys had been spotted around the building on the afternoon of the fire. When questioned, the boys, ages 11 and 14, admitted to being in the building, but denied starting a fire there. Neither was charged with starting the fire. The official report cites the cause of the collapse as the result of “rapid deterioration of the roof rafters due to the heavy burn and being termite-ridden for years.” This condition left little support for the main steel I-beam, which ultimately lead to the collapse of the front walls. The report also states that the fire department’s operations did not contribute to the collapse. Lt Geswell was detailed from L-26 to L-4. That night he used my uncle's, Lt Joe Donovan, helmet. When the wall collapsed they found the helmet and thought it was my uncle. 3 years late Lt donovan was shot in the line of duty and never returned to an active company because pf nerve damage to his hand. Later became an instructor at the Fire Academy. I remember meeting the fellow who had been shot when the guys from Boston came to NYC for the Holy Name Society breakfast....they stopped by LAD*108 for a visit back around 1971. Car 5 to FA: Urgent Message: FA: Car 5. Car 5: We're going to the BCH with a member who has been shot. Shots fired at Companies on Warren St. FA: We have that Urgent Message. Attention Companies! Car 5 reports that shots fired at Box 2141.
just returned to Quarters from Box 1787, pulled for a dumpster fire near St John's Church on Lawrence Ave. Ladder 4 was first due at 2141. On arrival at the Box, they reported nothing showing. The officer wound the box and reported to District 5 who had just arrived. “Hi Chief, it's another false. We have been out straight. Five or six false alarms, a couple of dumpsters and car fires along with the worker up in Grove Hall.” Chief Mariano told the Lieutenant, I’m sending the All-Out, let's go home." Just as Lieutenant Donovan was about to open the cab door of the Seagrave Truck, about 10 shots rang out. The first bullet struck the Officer as he grabbed the door handle. He immediately fell to the pavement and lost consciousness. Firefighter John Gaddis jumped off the apparatus and dragged Donovan to the other side. Firefighters Walter Austin and William Pero lifted the Officer and all three carried Donovan to the Chief's buggy, thus prompting an urgent message from the Chief. The Lieutenant was admitted directly to the Hospital from the Emergency Room where it was determined that the bullet entered his right hand near the wrist, traveled through his hand and tore off the tips of three fingers. After an operation, the doctors moved him to the ICU, his name on the danger list. He was in severe pain and was sedated. The bullet was not to be found. Later it was removed from a cab door of the 85-foot truck. Joe's mother was watching, of all things, Gunsmoke, at her home in Dorchester when suddenly the program was interrupted by Breaking News. The newscaster, quoting a spokesman at the hospital, reported that Fireman Joseph Donovan, assigned to Ladder 4, had been shot and is now at the BCH. You can imagine her anxiety not knowing whether her son received minor or life threatening wounds, or was even God forbid, dead. None of the five firefighters assigned to ladder 4 were injured. Deputy Chief George Paul questioned each member if he wanted to remain on duty or to be relieved. Although everyone was stressed, in the finest tradition of the Service the answer was obvious. In a late afternoon some days after the shooting, to underscore just how busy the companies were stretched, we were returning from an incident near the Children's Hospital a long way from Quarters when---Box 2254---- was transmitted. The FAO tried to get at least one Engine Company to fill out the card. FA calling 42, available? No. -- Engine 24:-- no.--Any company in District 5:- no response. Any in 9? Again the radio was silent. How about in Division 2; any company available: No response. FA to any company city wide. "Engine One is available." Respond to Box 2254, Wash. & Guild Streets; Ladder 4 reports fire shown. We had ran a big line directly from a hydrant and attacked the fire by operating between the three deckers. We could not raise the stick due to the elevated trains running along Washington St. While it seemed like an eternity, Engine 1 arrived in about ten minutes. There were now two 3 decker’s going. After a battle, the fire was out and we returned to Quarters to await another run. Finally on June 3, 4 & 5 the Command Staff issued Special Orders governing operations during these unprecedented days. All companies were to run with extra manpower with safety being the prime concern. Signal 10-17 was established. Ladder 4's crews were to relieve at Ladder 7's Quarters. 4 would leave the House, travel the length of Dudley Street and then to Meeting House Hill and return with the new crew following the same route. One thing became abundantly clear, that travelling up and down Dudley Street was not the way to cool tensions between the citizens and the men. Signal 10-18 was established “Riot Condition Exits” with GO# 29 issued on July 7. GO# 27 was issued on June 27, Item VIII, High Commendation for the Three Firefighters who came to the rescue of Lieutenant Donovan. The Commissioner William Fitzgerald forwarded their names to the Board of Merit for consideration. The Board concurred with the Commissioner after reviewing the circumstances and awarded Firefighter John Gaddis the Walter Scott Medal of Valor and Firefighters Walter Austin and William Pero, A Roll of Merit. (See GO# 21, 1968 Item-I, section 3). Lt. Donovan's hand and wrist were never the same. He lost feelings in his hand due to nerve damage and was disabled. Donovan's injuries prevented him from returning to fire duty, his true love. Remaining on the Job, he did not want to retire and was assigned to Maintenance and then the Training Division where he retired years later. I can attest that he was a first-class firefighter, a competent company officer and a real gent. Many incidents cited are from the memory of the writer. No member assigned to the single house at 198 Dudley Street during the summer of 67 is still alive, except of course, the author. Thank you for the information on my uncle. At the time I was in Louisiana getting orders to go to Vietnam in a few months so I never knew what had happened. It did make the newspaper down there though, complete with his name. Again, thank you.